Travel through the jungle wilderness areas of the Scarlet Macaw Corridor, following the Rio Tulin from the head waters in the mountains, all the way to the Pacific ocean. Pass through some very remote and beautiful areas of Costa Rica and enjoy a rich cultural exchange staying with families along the way . 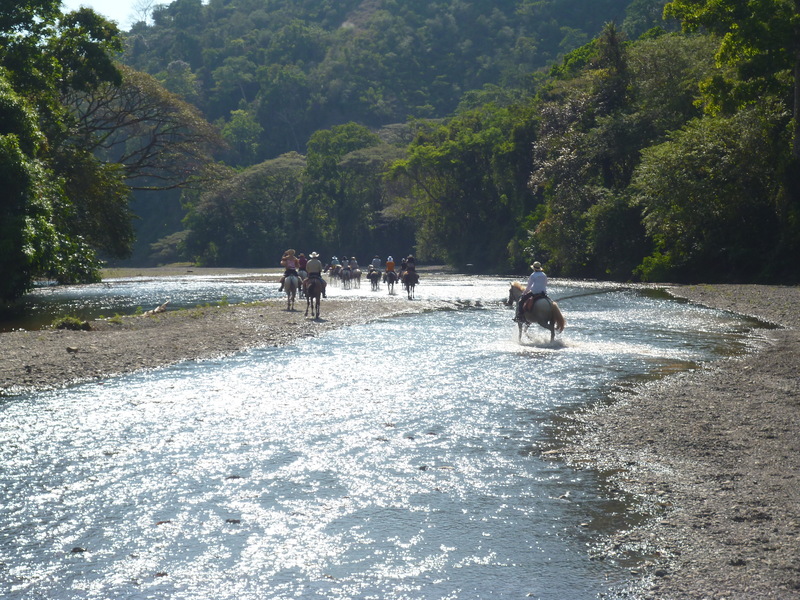 This trek is for experienced riders who want to partner with their horses and explore true wilderness areas of Costa Rica. We ask that you be in good physical condition and be able to mount and dismount your horse easily and quickly from a variety of footings and situations. You must be comfortable handling your horse on the ground. At times you will be riding on narrow and winding trails and there may be instances that you might have to lead your horse through some of the more difficult sections of the trail. The families along the way provide us with rustic accommodations and simple meals. We are only taking 4 riders on this trek so don’t miss your opportunity to join us on our most adventurous trek of the year. Day 1: We will meet you at SJO airport and drive for 1 1/2 hours the town of Salitrales where we will spend the night in a rural farm-house that overlooks the Scarlet Macaw Corridor. Here we will meet the horses, adjust tack, pack your saddle bags and answer any questions you may have about the journey. Day 2: Today you will be energized by the awesome beauty of the Costa Rica’s wild places. We will travel down through the Scarlet Macaw Corridor. But first a special treat, a peak into the past with a visit to an oxen run “trapiche”. Eduardo still processes sugar cane the way his grandfather did, with the use of oxen. Eduardo is known throughout the area for his oxen training skills. Traveling though private farms, through tropical forests and along the headwaters of the Rio Tulin we will be far from civilization. The trails are steep and rugged but the horses are well accustomed to the terrain. There will be steep switch backs as you descend down to the Rio Tulin. There will be rocky river crossings and steep bankings to climb. 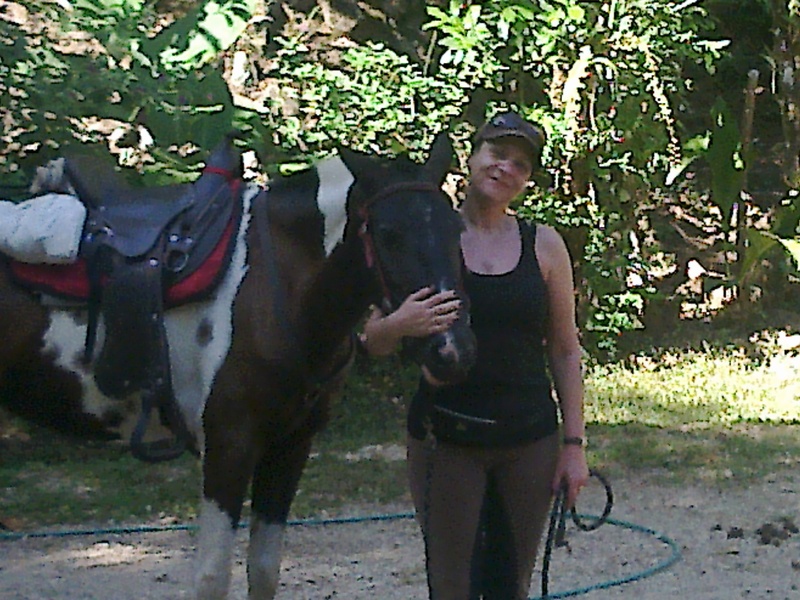 You and your horse will be partnering together as we ride these technical trails. After lunch and a cool off in a waterfall, we continue on to Verde Energia, “An intentional community dedicated to sustainability that has thrived against all odds.” Josh, the founder, will give you a tour of the farm and members of the community will make us delicious meals made from food grown on the farm. They have a swimming pool, an art center with a great dance floor, and you can often get a professional masage here. Day 3: In the morning we ride along the Rio Tulin again. We will spend the night at the Dairy Farm of Maria Eugenia. Maria runs the farm by herself and makes several varieties of delicious cheese which she sells in the towns and is proud to offer at the delicious meals she will serve you. Day 4: Today we will ride once again along the Rio Tulin. It is much larger now that it has gathered all its tributaries. We will ride all the way to the beach along the river. On this day we will cross this river dozens of times before arriving at the sea and the Hotel Delfin where we will spend the next two nights in well deserved luxury. Your luggage will be awaiting you at the hotel. Day 5: Today is our beach ride. We will ride on a nearly deserted beach to our favorite lunch spot on the beach under the cocoanut palms where a charming old man named Leo will cook us fresh fish for lunch. 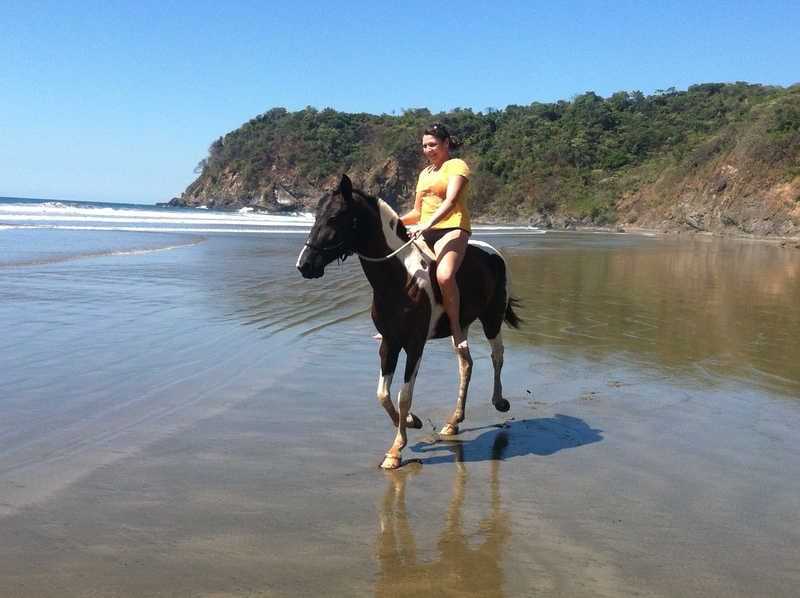 Here is where we will swim with the horses in the ocean and enjoy ourselves playing in the surf. Tonight we sleep at the beach front Hotel Delfin. Day 6 : Today is your travel day. The trip back to the airport takes about 3 hours. The staff at the Hotel Delfin will help you arrange your transportation back to the airport. Taxi’s are available for around $140 and can hold up to 8 passengers. You are also welcome to book additional days at the Hotel Delfin if you wish to stay longer. It is best to book your return flight for later in the afternoon to allow for travel time back to the airport. We are currently scheduling for this trek in February and March of 2019. If you have dates that you would like to book please let us know. All treks include airport pick up, all lodging, all meals (except for two dinners at the beach), and of course, horses, tack, and guides. Alcoholic beverages and soft drinks are not included.